Your children will be 200 % delighted ! No particular knowledge required, just be happy to walk along with a really kind animal that loves hugs. 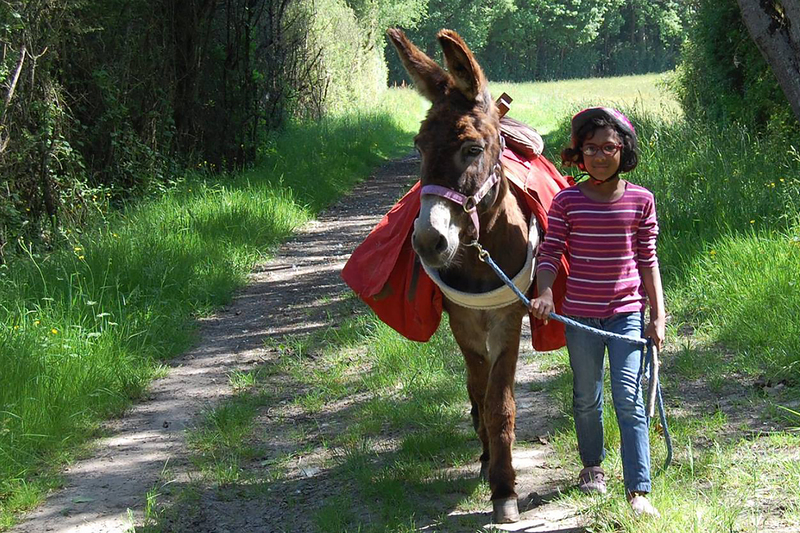 Donkeys are a great way to get children to like hiking. 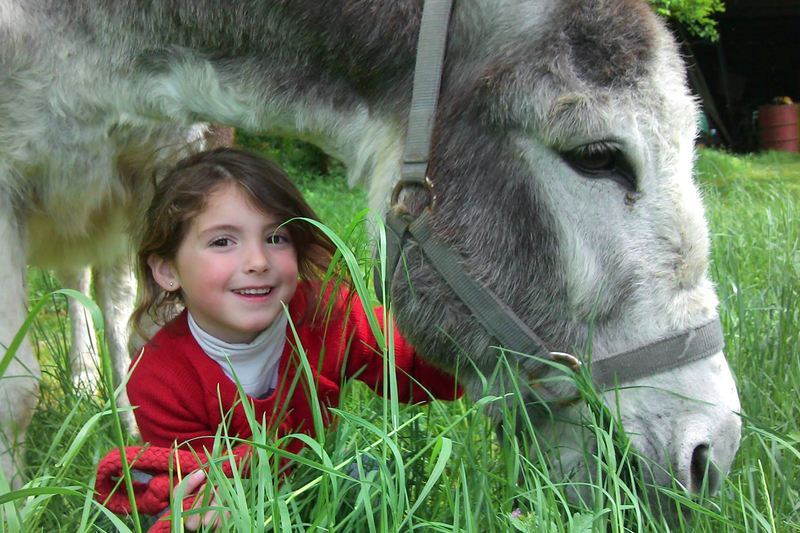 Intelligent, affectionate, curious, mischievous and food lovers ... our donkeys are sure to win over everyone in the family: children ages 2 to 6 will be delighted to do some 'donkey-back' riding, the older children will 'lead' their donkey proudly while parents and grandparents look on attentively!! The kilometers fly by with a smile!! 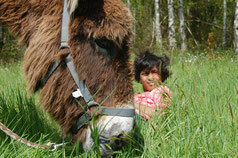 Each of our donkeys has his own specific personality (just like your children!!) so don't forget to show him who's boss? 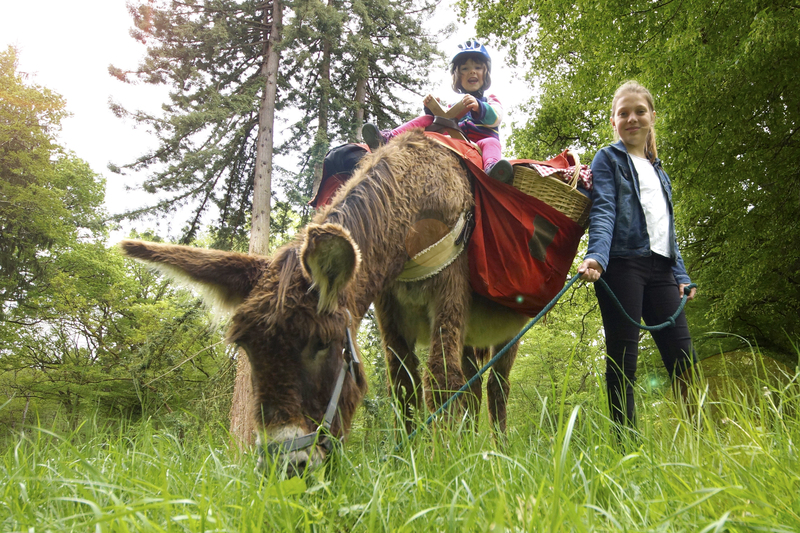 Before leaving, you'll be given advice and tips about how to hike with your donkey and your itinerary will be explained to you! 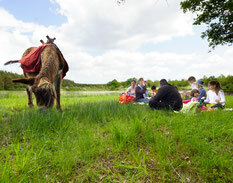 Our hikes are open to all and suitable for families with young children. Want to come get a breath of fresh air and amble along at a leisurely pace with one of our adorable companions? Choose the trip that suits you best from the list below! 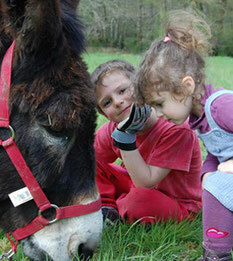 "Meet our long eared friends "
A short walk to get to know your donkey. 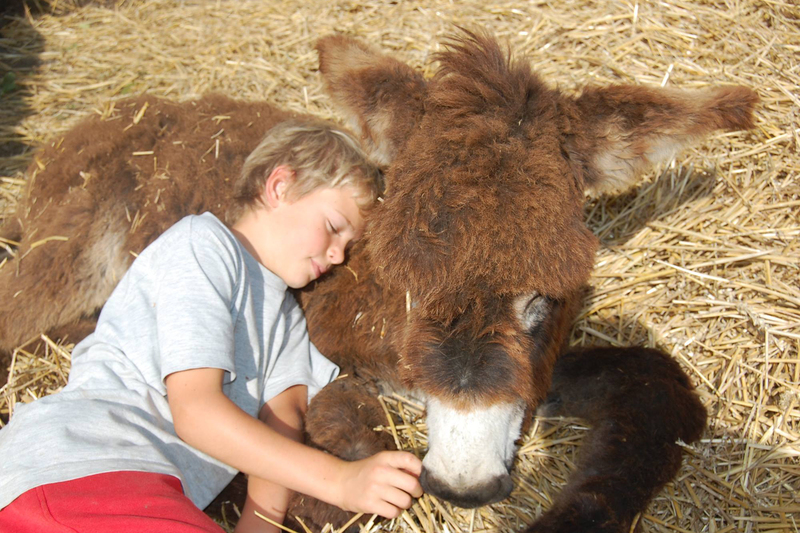 With a brush in hand, you begin by lightly brushing your donkey,to get know each other and begin to gain his confidence. 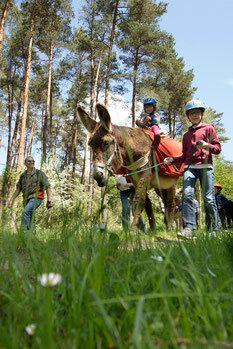 Then, your donkey will take you on little forest trails to get a big breath of fresh air! Children from 2 years of age. "Lunch on the grass" or "Afternoon snack in the forest"
>"Call of the wild" - a shaded hike on pretty paths in the depths of the Forest domain in Cheverny. > "From the chicken to the donkey"! A stroll for food lovers to the St Michel biscuit bakery and it's delicious shortcake biscuits and madeleines ..
You can even stock up on goodies from the St. Michel workshop and fill the big saddle bags on your donkey's back with treats!! These hikes are open to all Strollers/buggies can be brought on the hike, depending on the season. > "On the stags and does trail "
A hike to discover the "kings and queens" of the forests in Sologne.
" 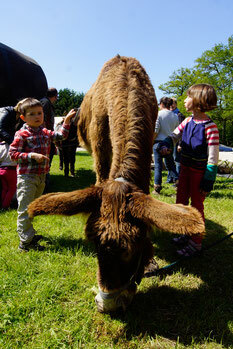 Food and wine tour to discover AOC Cheverny and Cour-Cheverny. 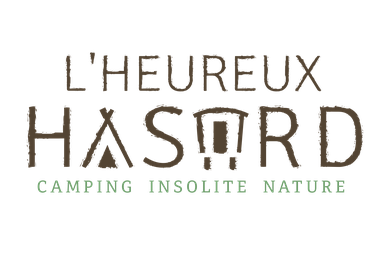 You'll stop at the Domaine de Montcy (organic vineyard) for a break and some fun for all ages with the game "Mystery of the golden bunch of grapes". A hike to discover an ecologically responsible company in the Cher Valley. From nature to industry is the theme of this trip. Visit the workshop to see how the shortbread biscuits and madeleines are made (booking necessary). To be enjoyed without restraint! Have a look around the shop and treat yourself to some goodies .. our donkey's saddle bags are huuuuuge!!! Opening hours at the Atelier St. Michel in Contres are here. 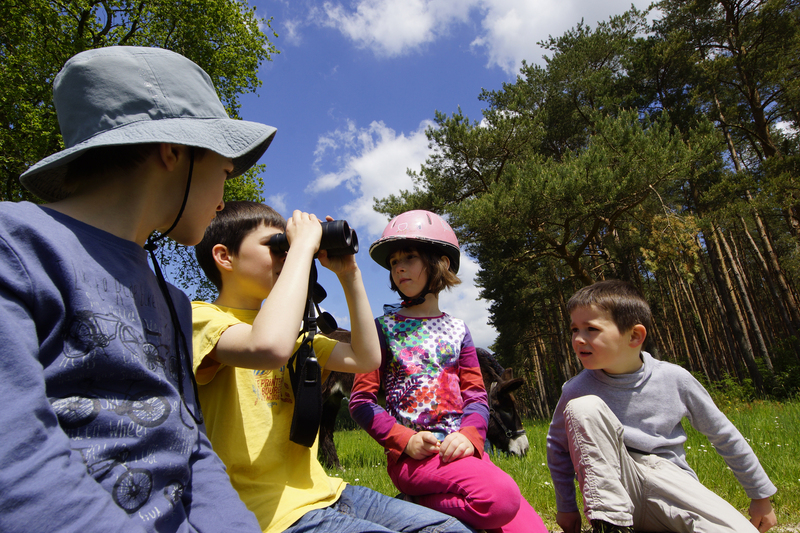 These hikes are suitable for children from 4 years of age.